Inclusivity “an intention or policy of including people who might otherwise be excluded” is one of my favorite words. Living on a planet with so many diverse people can be a challenge from an inclusive perspective. Yet, like eating an elephant the massive task of creating an inclusive world begins within each of us. Have you ever envisioned something so marvelous and so vast just thinking of it makes your heart sputter? No matter what you do the idea plagues you to the point of obsession and you cannot let it go? Has your brain worked overtime seeking ways to make your dream reality so much so at times it shuts down? Ever since the birth of BBB aka Bold Blind Beauty we had a dream of changing perceptions on blindness. We dreamed of helping blind women feel more confident, beautiful, and empowered in a world that doesn’t quite understand or accept us. Our hope was to bring together sighted and non-sighted communities to show that we share more in common than we presume. Our journey is taking longer than we anticipated. We’ve hit a few bumpy roads, have broken down, taken detours (sometimes down the wrong road) yet we continue moving. From our first Woman On The Move, the Abby unveil and developing the online store, we’ve celebrated many firsts. Today, we are thrilled to show you our very first tactile coffee mug. 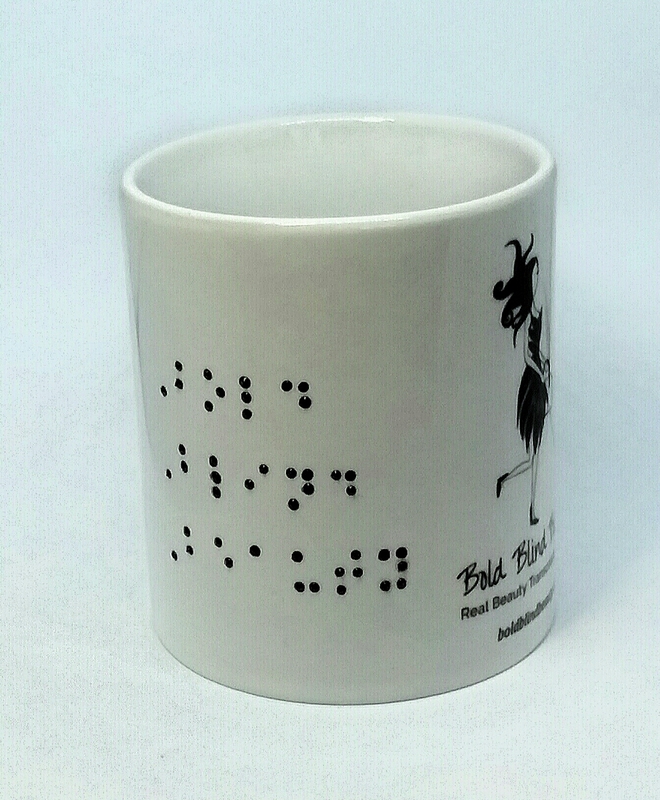 Yes, that’s right our very first mug with tactile braille incorporated into the design. We expect to have the tactile mugs available to buy this summer, so stay tuned! Last year we focused on updating the site. This year the focus is on marketing and expanding our line of merchandise to include pretty tactile products. Be on the lookout for some fascinating things to come over the next few months! A Bold Blind Beauty Coffee Mug features Abigale (Abby) to the left & right of the mug’s handle. In the center of the images are the words “Bold Blind Beauty” stacked vertically in raised braille. Congratulations, dear Stephanae. That’s a fantastic mug! Hi Patty, I don’t know how your comment ended up in my spam folder but I just found it. Thank you for commenting. Now the FB message makes sense to me. Hugs!!! What a cool coffee mug!